For me the best part about junk hunting is finding something I’ve never seen before. That’s what happened a couple weeks ago when we dropped in on a tile/granite/building materials yard in nearby Rubidoux. I wasn’t in the market for any of the items advertised on their striking homemade signage but I had seen some intriguing items cast off to the side … I immediately homed in on a cool rusted bumper from an antique car, an awesome rusted pole with a nice hoop at the end of it and some other rusty machinery I could work with. It was then I noticed the owner running over to tell me none of the items in the pile were for sale … drat, I hate that! I tried to appeal to her good nature, then her business sense but she would not budge. Unwilling to leave yet, Paul and I wandered around the rest of the property, going all the way back into a weedy area behind the gravel piles … I found a great concrete pylon, and the unknown: a T-shaped galvanized steel thing with circular holes at opposite ends. I really wanted it, whatever it was, and then noticed a man running toward us, looking a bit concerned … what exactly were we looking for? he asked. I told him I liked buying junk and wanted the pylon and this galvanized thing … and by the way, what is it and how much do you want for it? He explained that he used to raise birds and that it was a birdhouse; that the dual openings were where the birds entered the house to build their nests … and, that I could give him $3 for it! I insisted he take $5, so he threw in the pylon for free … junk hunter nirvana! Back home, I didn’t have time to think about what I could use the birdhouse for, so I set it off to the side. Fast forward: while reworking the kitchen deck’s seating area as part of my last-minute garden tour prep I came up with a use for the birdhouse. Using two galvanized boxes from my back shed, I suspended the birdhouse T to create a block-y buffet of sorts. Loving the effect of the two dark circles a either end, I placed a brick square (with a same-sized circle opening) in the central recess at the bottom to reinforce the circular graphic punctuation. 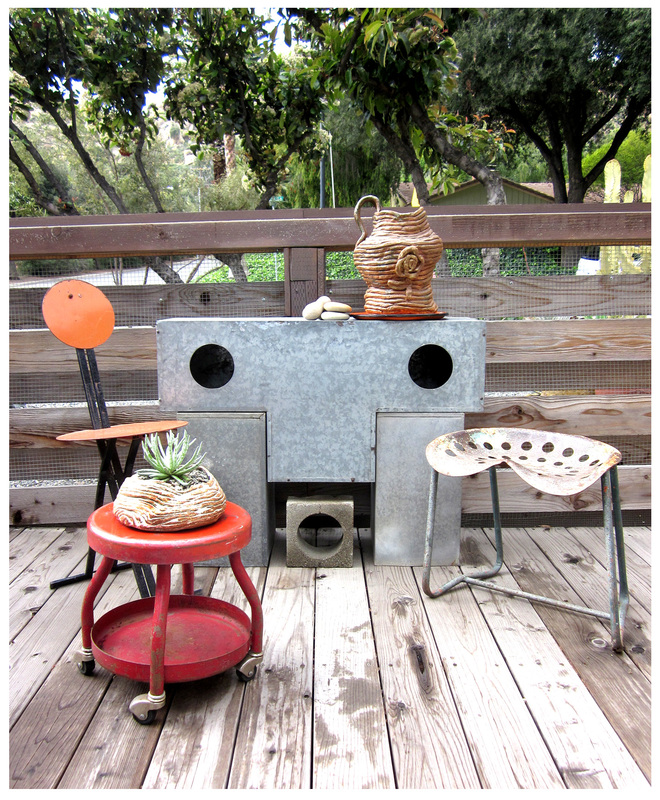 Adding more metal, and more circle shapes, I bring in an orange-and-black metal folding chair, and a red metal shop stool; a chair made of an old painted metal tractor seat faces them. Two schlumpy pieces of coiled pottery, a senecio starburst, some smooth pebbles and an enameled charger, soften the scene and add visual variety. 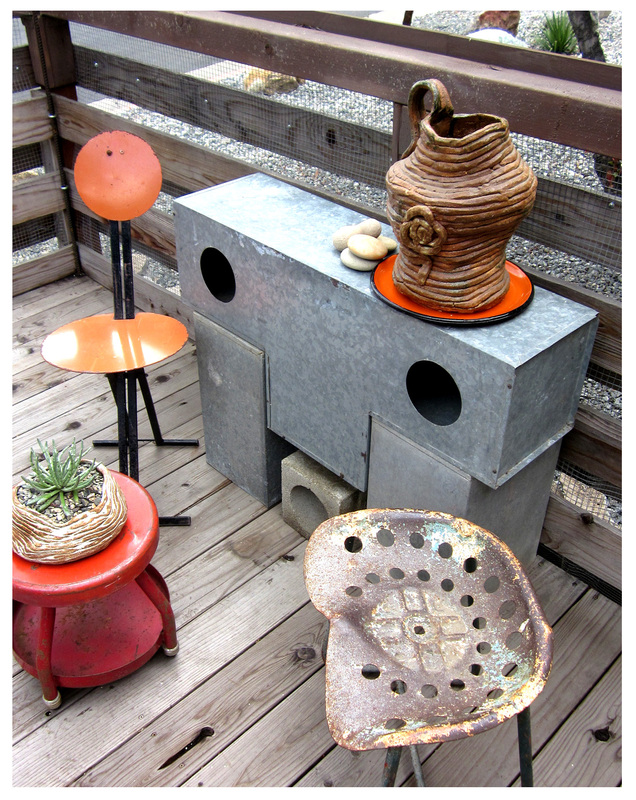 I love this new tidy area at the end of the deck; it’s colorful and unexpected. And, if some fine feathered tenants show up to check out the real estate I won’t be too surprised! i love your new “birdhouse”! maybe you will get some barn owls hanging out in there. all those fun colors, repeating circles, and inviting seating options! and you can never go wrong with a large coiled pot or two! the best thing, however, is the story behind the great stuff! I do go on, right? … I wouldn’t mind barn owls as long as they don’t have a taste for chihuahua flesh … Frito and Inky would not approve!